These made me lol, which is a hell of a trick today – evil back is being, well, evil! 25 YouTube Comments That Are Actually Funny. This entry was posted in Funny, YouTube on April 2, 2012 by Romana Challans. Just your average family…living sort of like the Jetsons. I think we are a pretty normal family. Well, probably more geeky than many, so put us about one or two years ahead of average joe, joette, and the little joelets, in their use of tech. And i have been noticing one of those changes in techland here surrounding my own test case family. Let me expound, explain, and expand. Or expostulate, even. Currently, we share one internet connection at two houses, ie the modem at each house logins to the one account. At house of much citrus tree goodness, there is 79years old but miles younger in attitude, the magic that is my dad, aka grandpa , who is tech Scrooge – computers are bah humbug, digital free to air is confusing enough for him, and this from a former engineer! He lives there with our no 2 daughter, the darkly delightful scarily smart and alliteratively amazing ms 19 – and her MacBook Pro. Youngest three visit frequently and have sleepovers, so that means usage is pretty consistent. Ms almost 17, the budding chef and creator of joy and delight wherever she goes. Linux laptop/family 27″ iMac(was mine, but ours is more accurate)/iPhone. Ms 10, born performer, dancer of unique and stunning dances, actor of amazing stories, singer of magic songs, and dreamer of wonderful dreams, and her iPad 1/family 27″ iMac. Master 8, only son, sunshine, intelligence, geeky dude++, full of beans, and the only child I have met who could find a way to get dirty in a clean room, and his Android tablet/family 27″ iMac. The Bloke, aka himself, Gorgeous Man, engineer, tractor fiend, and go to man for all systems solutions. Linux laptop, Linux desktop, swears one day he will use the family 27″ iMac, Galaxy Samsung 2 phone. And me, researcher, developer, engineer, user of wheelchair and delightful new scooter, (speed demon at over 9km/hr with it too! ), and lover of all things geek. iPhone/13″ MacBook Air/iPad 2/family 27″ iMac. Various ring in laptops and mobile phones and wireless devices needed for both The Bloke and I to use as part of our roles on The Serval Project. Storage of nearly 8tb now in just external hdds, a fee portable 500gbs are useful for my frequent traveling/work/sharing between households. So, the tablets for kids are recent – the iPad 1 is a secondhand acquisition from a friend, the Android one is one I do some UI dev on for The Serval Project, and in between is perfect for Master 8. Introducing tablets to the smaller two was a recent tentative experiment that is now a gratefully embraced fixture. To our surprise, it has reduced fighting, and actually the two are often found harmoniously side by side, sharing games and sites. There is more socializing happening now than before! Let me enlarge on that with a discussion on how we use the tech. They both have games and books and apps that we approve of only. ABC Australia has a wonderful app, IView which is a huge success (the Android tablet which shall not be named – stupid Acer – is lovely hw tech but awful version – Honeycomb blegh, and fails to play iView via its website, there being no native app. A Cyanogen Icecream Sandwich tablet version which is promised is LONGED for here). The BBC iPlayer is hammered by both Ms 9 and myself, documentary junkies we are. Both provide tv, both current and beloved in memory. I also stream through network from the storage mentioned above. The little ones and I grab a tablet, (and if more,when himself &/ ms 17, via the 27″ as a family together), curl up together to share viewing often. The tech is rarely isolating, and is more interactive shared than passive television. So the point of all this is how a slightly, ok hugely, geeky family is seeing the future now. I am fascinated by how this has all developed, and evolved, partly due to work requirements and demands, and partly due to my geek love of tech, but most of all by both the eager adoption and surprising rejection of different tools by the kids. Linux laptops were exciting but quickly discarded – the tablets proving to be the most intuitively used, and thus a hit with the small ones. Again, the iPad is clear winner in that*. The most interesting thing, to return to bandwidth, has been usage. Two years ago, 100gb was heaps. Now, we have just upgraded from 600gb to a 1tb plan. We don’t have cable or anything like that, all our watching is based around free to air or streamed video via apps. So while we aren’t wealthy by any stretch, we are just a foreshadowing of what tech will be like for everyone – casual, ubiquitous, and above all, highly consumed! *look, I want to ADORE Android. Open Source FTW!!! And I like the Galaxy s2 hardware, and some of the newer handsets are stunning, even nicer form factors by miles to the currently a tad blocky chocolate bar iPhone 4. But after using an iPhone and iPad, I realize, and have observed in others, (especially the agnostic to brand but not experience and usage kids), that no matter how good the hardware, (and some of it is very very good indeed), the core operating system doesn’t matter as much as the way you use it, the way it looks and feels and responds. And app availability – less than a third of what they have in the iPad could we find equal or similar options for on Android Marketplace. I really want Android to succeed, to drive iOS into better product races – for both of them to have to constantly strive to make things better for consumers. But honestly, in tablet land there is no competition. And the Apple approach to an iEcosystem(tm no doubt) is second to none, though Amazon is attempting it. But only in the US for now, so from our pov, so what? apple is here, and now, and it just works, or close enough to. Google apps are seamless on Android, and I am a google girl through and through, but I can use my beloved apps perfectly well on iOS. As I so often say to anyone who hasn’t been forewarned and can thus run away, the UI, the part it plays in the user experience (which is not JUST UI, but rather has UI as a core major component, ), is the key to the whole thing. Here Android is polished engineering, but not anywhere near polished User Experience. And fragmentation by desperately adding on vendor niceties just shows the flaws, not fixes them. This entry was posted in Family Friends Pets Kids, Internet Technology, Tablets, Thoughts, YouTube on December 23, 2011 by Romana Challans. I know people who have struggled to have a child, and your heart aches for them, you know what amazing wonderful parents they would be. Then there is this utter douchebag – a judge beating the hell out of his disabled daughter with a belt – then coming back to do it a second time. With the collusion of the mother. Damn. He is bitching now that the daughter, who secretly videoed the ongoing abuse, has ’caused trouble for him’. There are no words i can use in public for the depth of my loathing for people like him. Let us just say i lose my normal live and let live approach and turn old testament about it all. Those who abuse the powerless, especially their own family, are evil, vile monsters. i can sort of understand snapping once (just) and living with the regret of that, trying to be a better person, but this sick b*st*rd really got into this. Sick doesn’t cover it, actually. And she has a younger sister still living at home, so i can understand her releasing it. Watching this video breaks my heart. It should break everyone’s heart. And i bet this evil man gets away with it – after all, a Texan judge? The Internet is blowing up with a video allegedly posted by the daughter of an Aransas County judge that she says shows him beating her. Someone who says she is the daughter of Judge William Adams posted the 2004 video only recently. The hard-to-take clip shows a man whipping her with a belt because she was downloading music from the net. via Texas Judge William Adams Allegedly Beating Daughter: Horrifying Video (UPDATED) – Houston News – Hair Balls. This entry was posted in Disability, Health Wellbeing, News Reporting, Politics Rights, YouTube and tagged Abuse, Aransas County, Aransas County Texas, Children, Clip show, Daughter, Evil, Music download, texas, William Adams, YouTube on November 3, 2011 by Romana Challans. Neil Gaiman interviewing Terry Pratchett about his latest Discworld novel – but it isn’t Xmas yet! Hey, i will take the gift of video goodness anyway – yay! Terry Pratchett on Snuff – Boing Boing. 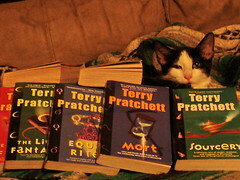 This entry was posted in Books, News Reporting, YouTube and tagged book, Discworld, interview, Neil Gaiman, terry pratchett on November 2, 2011 by Romana Challans. There is an unfettered joy rarely seen in the barely clad, ego inflated, writhing, pseudo sexual people in hip hop, rap (and the ilk) style film clips nowadays. A loss shown sharply & poignantly in these delightful clips..
‘Soul Train’ Lines, 1970s | HOW TO BE A RETRONAUT. This entry was posted in Music, YouTube and tagged Music, retro, retronaut, soul train on October 2, 2011 by Romana Challans. Carl has been a lifelong inspiration. Neil is a worthy successor, who will be doing a much anticipated Cosmos followup soon. When Neil deGrasse Tyson met Carl Sagan – Boing Boing. This entry was posted in Science Knowledge, YouTube and tagged Carl Sagan, neil degrasse tyson, science, YouTube on September 30, 2011 by Romana Challans. This entry was posted in Meanderings, Science Knowledge, YouTube and tagged astronomy, science, Space, YouTube on September 29, 2011 by Romana Challans. This entry was posted in Creativity, Linux/Open Source, YouTube on December 2, 2010 by Romana Challans. This entry was posted in Funny, Music, YouTube on July 31, 2010 by Romana Challans. This entry was posted in Books, Funny, YouTube on July 25, 2010 by Romana Challans.